There are several ways to change the brightness of a video into Studio. One I like and that I most often use is called Selective brightness. I recently discovered a very useful and undocumented feature of this tool that I wanted to share with you. 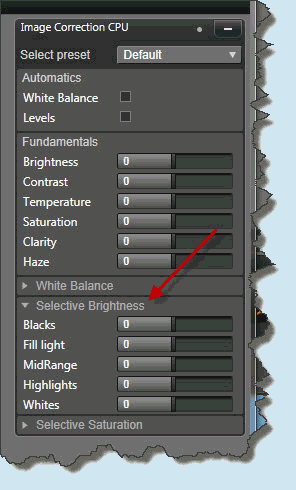 How to access Selective brightness ? This effect is part of medias Corrections of Studio. To open it, double-click a video in the library or a clip on the timeline. Pixels of an image have almost always different brightness intensity values. Instead of changing the overall brightness of an image and thus increase the light intensity of each pixel uniformly, Selective brightness effect can change separately certain ranges of light intensities : Blacks, Fill light, MidRange, Highlights, Whites. Photographers are used to say a picture has blown out highlights or crushed black. These terms correspond to very over-exposed areas (pure white) or very under-exposed (deep black). With Selective brightness it's easy to correct a crushed black image : increase the Blacks sliderand only the darkest portions of your image become brighter. The happy owners of a camcorder with this function can judge at a glance of the distribution in their image of dark and light tones. 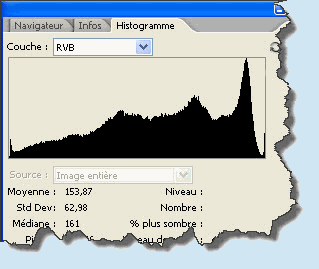 The dark pixels are presented on the left of the histogram while the bright pixels are presented to the right of the histogram. The more pixels there are of the same brightness level and higher is the peak of these pixels. There is no histogramm in Studio, so we will have to do with the means at hand. Even better, if once hovering over a pixel you hold the left mouse button pressed, moving the mouse right and left, the cursor corresponding to the light range of the Selective brightness effect increases or decreases. At the same time the result of adjustment is immediately displayed in the viewing window. To apply this tip to a video take a snapshot of your video and use this still image to make your adjustements before duplicating them to your video. Just below Selective brightness is Selective saturation. The principle is exactly the same as selective brightness but with ranges of colors intensities instead of light intensities : Red, Magenta, Blue, Cyan, Green and Yellow. WARNING: this comment section only relates to the current article. All technical and/or general questions regarding software detailled in our article *MUST* be asked through various forums; we won't even answer to comments which do not comply to this basic rule, and we might even moderate it. Thanks in advance for your comprehension. Comments support tags : [quote]Text[/quote], [b]Text[/b], [i]Text[/i], [u]Text[/u], [url]www.sample.com[/url] or [url=www.sample.com]Link name[/url]. You can use these tags to highlight your text or insert a link in your comment.